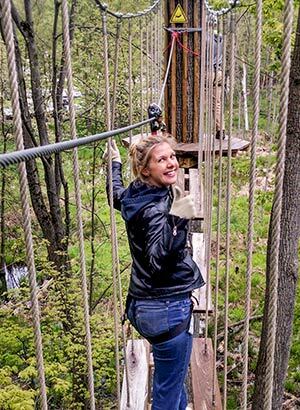 Despite a fear of heights, Fresh Water contributor Hollie Gibbs took to the zip lines, rope ladders and Tarzan Swings of the Go Ape Treetop Adventure course in the Cleveland Metroparks' Mill Stream Run Reservation to bring the experience to life for our readers. How many will choose to take on the challenge for themselves or be satisfied by living vicariously through Hollie is anyone's guess. I made the reservations for Go Ape on a beautiful 76-degree, sunny Cleveland day. I was prepared to courageously overcome my anxiety surrounding climbing and heights, effortlessly laughing in the face of pending danger. By the time the appointment rolled around, it was 40 degrees, windy, and lightly hailing. Go Ape is open rain or shine, though, so off my husband and I went to climb into the woods and prove something to myself and those who know me best. Hollie Gibbs We pulled into Mill Stream Run Reservation in the Cleveland Metroparks and parked near the chalet and toboggan chutes. Soon we were gathered into a group of seven where a very enthusiastic instructor named Chelsea provided us with all the details that would prevent us from plummeting to our deaths once left to fend for ourselves 40 feet up in the trees. Twenty minutes after we gathered, we climbed to our first wooden platform via a rope ladder attached to a tree. I did not feel like my cotton-gloved hands were gripping securely, and I was already regretting not buying the climbing gloves Go Ape sold in the building. Perhaps it was less the soft gloves and more my paralyzing fear of heights kicking in. Nonetheless, I would climb without gloves, my knuckles reddening from the chill. My initial thought upon the test platform was that we were not as high up as I’d imagined, but I was certain the plunge would do no less than maim me anyway. I could focus my attention away from my unease when I had a task to perform (clip first carabineer onto second line, unclip second carabineer from first line); however, standing and waiting gave me more than enough time to contemplate all the ways I could fall. We slid down zip line number one, which was a test zip. We had one last chance to turn back before our instructor released us into the wild (which was replete with trails below the course where family, friends, and strangers photographed our antics). I smiled, enthusiastically announcing that of course I’d continue, hoping my face betrayed my nerves. All in all, I would climb five rope ladders (one at the beginning of each of five separate stations). I would traverse 3,039 feet, crossing various beams; ropes; rings; tightrope-like wires; wooden slats; narrow platforms; and webbed nets, and speed down five zip lines over five acres in three hours. The longest crossing is 45 feet, and the longest zip line is 561 feet. There are two areas on the obstacle course that allow participants to choose a moderate or extreme path. I chose the moderate “twister” (a horizontal spiral ladder that could have been inspired by M.C. Escher) instead of the extreme pirate crossing with its alternating cargo nets. In one of my best decisions of the day, I opted for the extreme Tarzan swing in place of the moderate lily pad crossing. I am embarrassed to admit that I failed to yell out with a ‘Tarzan Call’ as I’d intended. After conquering multiple obstacles along the course, each section ended with a zip line that would carry us back to the ground where we’d walk to the next station (with the option to stop before each one, should we choose not to continue). The reverberation of metal on metal grew louder to announce a zipper’s arrival. The wood-chip padded landing strips sloped upward, and I only managed to land on my feet once. But as long as I was safely on the ground, I was happy. Luckily for us, the rain kept the mosquitoes away, but the course is typically swarming with them as the four large zip lines carry you over wetlands. Hence, don't forget the bug spray. Our group followed a family of 14, two of whom were petrified and sat down the entire time allowing their harnesses to carry them from obstacle to obstacle instead of forcing their legs and arms to obey their brain’s commands. That strategy did not work for me as I trust my own body more than any apparatus strapped onto it. My husband chose to take advantage of both, though, attempting tightrope tricks and relying on the harness to catch him should he fail. Our group included a fearless, young girl celebrating her birthday who did the Go Ape moniker proud by literally swinging like a monkey throughout the course. Her parents participated in spite of the fact that her father was terrified of heights. I welled with respect for him as he endured four of the five course sections in order to celebrate with her. Although he skipped number four to take photos of his daughter on the Tarzan swing, he returned to finish number five with his family. One day that girl will appreciate how special her dad is. As I flew down the final zip line, a smiling instructor was there to cheer me on, and we were soon met by Chelsea, who congratulated us. We stuck around to watch the birthday girl’s father make his triumphant final zip. I had shared his fear going up into the course and wanted to share in his victory as he saw it through past the final challenge. At the end of it all I was presented a certificate of completion to prove to the naysayers (namely, my children) that I did it. 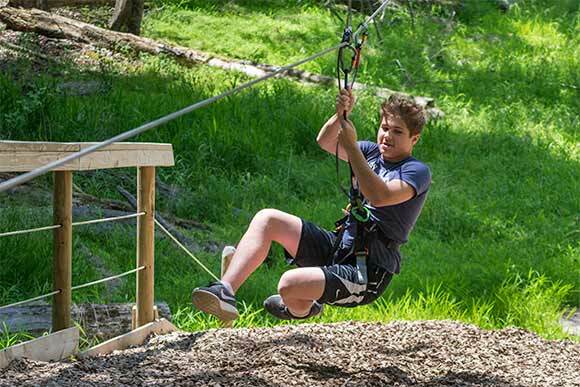 They now want to tackle a junior version of Go Ape in another state. I would happily undertake the adventure again, although it did feel good to relax after three hours climbing around in the cold treetop canopy. I was proud of myself, although my husband didn't seem as impressed. But as it turns out, he never had any doubts I could do it. Th Cleveland Metroparks is part of Fresh Water's underwriting support network. 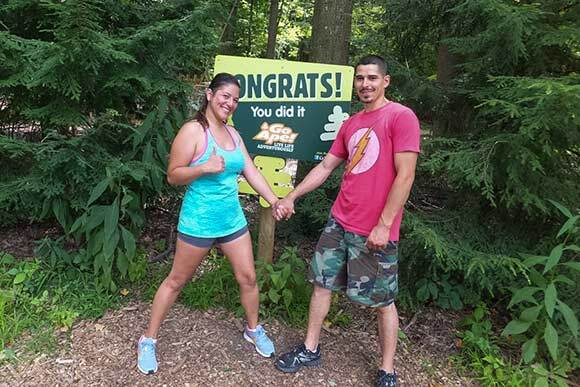 The partnership between the Maryland-based Go Ape and Cleveland Metroparks began when the the park system released a Request for Proposals for treetop adventure course services that returned revenue back to the organization while the total capital investment would be paid by the vendor. Now for $57 for adults, $37 for kids age 10 through 15, people can glide and climb through and above Mill Stream Run Reservation, which expands on the options of biking, boating, fishing, swimming, hiking and archery. The course, which opened in May 2015, challenged approximately 11,800 visitors last year and opened a full month earlier this year. Participants do not need to be overly athletic to experience Go Ape and enjoy the unique canopy view the course provides, but upper body strength and balance are used extensively. Go Ape is open March through May and September through December on weekends and select weekdays and June through August every day.